After 3 patches buffing Human, Demons, Elfs and Machina Madhead decided to finally give some long to one of the most popular races in the game with the release of Version 16.0 Apocalyptic Sanskrit. In that patch they introduced 3 Gods leaders that allow to play God members of any attribute, the three leaders offer different sets of tools and gameplay and in Vishnu case he is is in my opinion one of the best designed leaders ever released in the game. He is so good because let's face it, Dark Gods are a really powerful and giving Pollux and Luna full support is something that everyone likes. 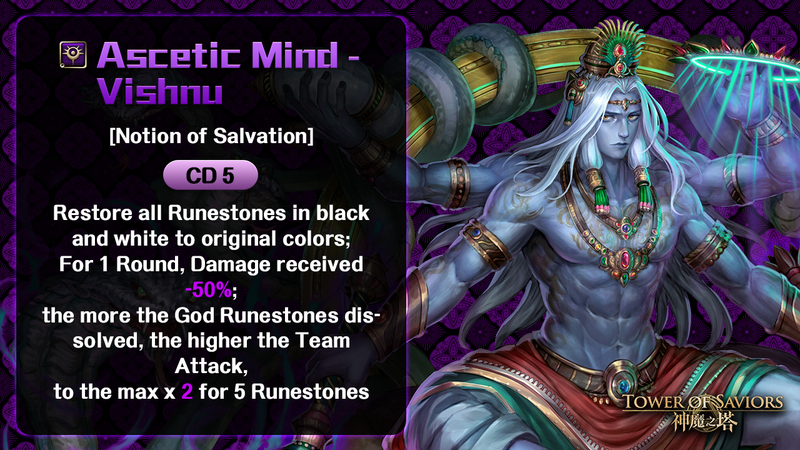 Hindu Gods set the rules so you hardly ever have a bad board and by fulfilling the conditions you get awesome benefits like damage reduction, shared Runestones effect and additional multipliers. This team skill operates in a similar fashion to Babylon Gods, you need to dissolve either full 3 rows or 6 columns with Water, Fire and Earth to get the full benefits. The attack multiplier might look low on first sight but since you have access to God Runestones and large chunks of skydrop of your type Vishnu can ditch around 3m damage with no active skills with a decent board and spinning skills. The damage reduction condition is the same as the one for the bonus so using for stalling might be a bit harder, also the damage reduction is not that high as Atlantis for example, but his active skill short cooldown makes up for this. 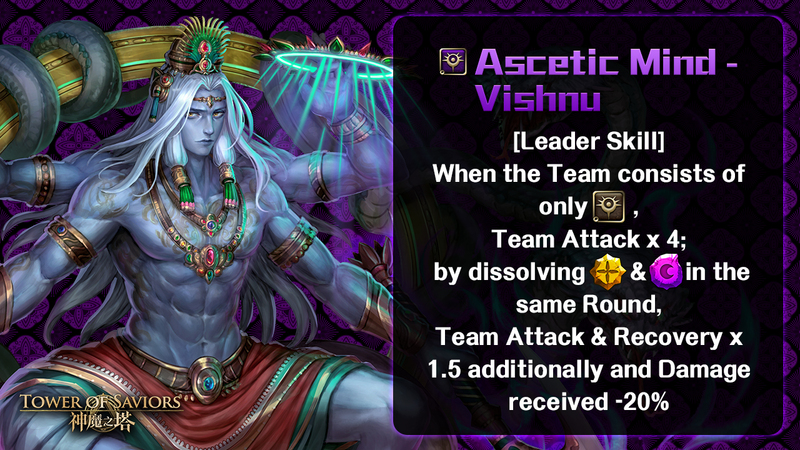 Utility, damage reduction and attack boost, at just CD5 makes it so Vishnu can bring a shield when really needed, the skill uses 2 buff slots so if used properly you can abuse this to push enemy debuffs like 98 rounds phantom, poison, or damage path. Since this skill is so good make it so you can consider Vishnu as member for other God teams as well (Think of Artemis on Namtar if needed, damage reduction is not a common thing to see in dark attribute). Initially Madhead showcased Vishnu with Lucifer as team member rather than Pollux, but personally I find it pointless and disgusting because Lucifer won't have as much damage to absorb and his conversion is pointless because of Vishnu team skill makes it so it is better to have a Water fire and Earth board. Here I could list A TON of members, specially those of utility because he is able to slot Gods of any attribute and pull it out, yet the best options are actually Dark and Light Gods, so I will try to stay on those that are the most popular in leaderboards and less situational. 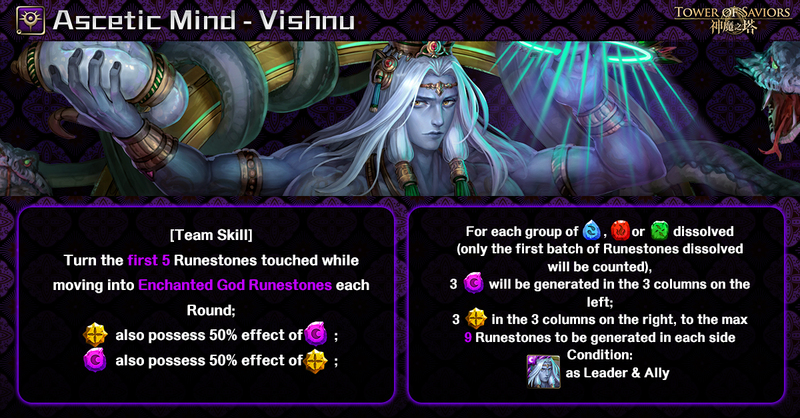 Be aware that since Vishnu can generate his own runestones so he doesn't really need much conversion unless you are facing specific shields. Dark Perception - Lakshmi: The damage that she offers is really high and have almost full uptime thanks to the team skill of Hindu common cards. The only tricky part with her is that despite the effect is in play it will need a trigger by dissolving light, dark and heart, this is not that hard for Vishnu but still makes it RNG. Supreme Lotus - He Xian'gu: She is able to provide a substantial amount of of constant damage thanks to her continuous effect, the additional 6 runestones generated are also appreciated but those come by dissolving light and dark in the first batch which rarely will happen in Vishnu. Her effect lasts until you receive damage but the cooldown is so short that it doesn't matter that much. Anubis the Jackal of Life & Death: a bit comparable with He Xian'Gu his buff is not that volatile and you get cooldown reduction upon deactivation so it is possible to have both of his boost in play during 1 turn. The increased dark runestones drop rate can chain pretty well with those generate by the team skill and the boost will affect everyone if you stack it with Luna active. Personally I think that Anubis deserves some kind of upgrade but he is still strong. Sagacious Sage - Sun Wukong: I am often criticized because I like to play Wukong with his Dragonware as member for this team. He is able to ignore enemy armor for 1 turn and convert any type of runestones to light which for Vishnu that is fine (this is good against petrified runestones enemy for instance). The dragonware makes it so he is CD5 and you get 1 more second of runestone-moving time that stacks with the one provided by Luna. Wealth Pursuer - Kubera: so Vishnu active won't be enough to survive?, then you can use this guy because 2 rounds of 80% damage reduction is pretty nice and the boosted attack for leader and ally is also really appreciated. His stats are quite high with 3.4k HP. The cooldown is a bit high but I think is fair for all that he offers. Chakra Epiphany - Indra: You can see him as the F2P poorman version of Luna that comes 2 turns faster and offers conversion. His stats are decent so if you are still missing Luna you should consider farming Indra as an option. Hel the Morale of All: Personally not favorite in this team, Vishnu does have increased recovery by dissolving light and dark so having heart effect on dark runestones is more oriented to overheal like in Artemis or Namtar. If you don't own Qi Tian Di you can go for Odin or Khaos for stats. I like to play this setup in stages that don't require much utility, the additional time comes from Luna AR and Wukong Dragonware. Wukong conversion helps to deal with things like blocked runestones that can't be dissolved or trojan combo.